Karen attended Northampton Community College and graduated with an associate’s degree in dental hygiene in 1990. Karen has worked part ­time at Hellertown Dental Group since 2000. She currently holds a hygiene anesthesia license, which means she is able to administer anesthesia. She is also certified in CPR. Karen is a true people person. 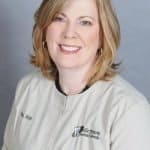 She enjoys educating and sharing her knowledge of dental hygiene and dental disease, but Karen is always open to being educated by her patients as well. Karen resides in Bethlehem with her two children and three dogs. In her free time, she enjoys sports, exercise, and traveling. In fact, Karen has been a certified group fitness instructor since 1992. She is knowledgeable about the benefits of all types of exercise and general well­being.